Welcome to my website which describes the organizational and social transformation work I have been doing since the late 1970s. Prior to that time I was a businessman/entrepreneur. Here you will find more information about me, some videos and podcasts, the services I have offered, summaries of my books and speaking topics as well as links to articles, past newsletters and guest blogs. Watch “A Maverick Futurist’s Global Vision: with John Renesch” – a bit over four minutes long. 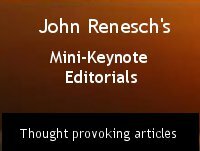 Create the future you want..
John’s Mini-Keynote Editorials cover a range of thought provoking topics. 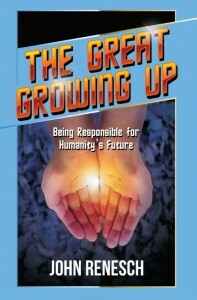 More about John’s book and read his monthly blog postings. John regularly contributes articles to the Global Dialogue Center.